Below are common attributes associated to Butterfly Bush. Become a care taker for Butterfly Bush! Below are member comments regarding how to plant Butterfly Bush. No comments have been posted regarding how to plant Butterfly Bush. Be the first! Do you know how to plant Butterfly Bush? Below are member comments regarding how to prune Butterfly Bush. No comments have been posted regarding how to prune Butterfly Bush. Be the first! Do you know how to prune Butterfly Bush? Below are member comments regarding how to fertilize Butterfly Bush. No comments have been posted regarding how to fertilize Butterfly Bush. Be the first! Do you know how to fertlize and water Butterfly Bush? Below are member comments regarding how to deal with Butterfly Bush's pests and problems. No comments have been posted regarding how to deal with Butterfly Bush's pests and problems. Be the first! Do you know how to deal with pests and problems with Butterfly Bush? Get Purple Haze Dwarf Butterfly Bush fresh and large directly from the grower to your garden! Buy Purple Haze Dwarf Butterfly Bush online from the nursery wholesalers and save BIG! 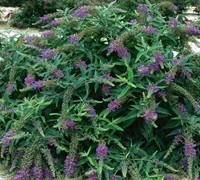 Lo & Behold Purple Haze is a true dwarf butterfly bush that has a mounding, spreading habit with uniquely horizontal and arching branches. In my garden, this butterfly bush produced an abundance of dark bluish-purple fragrant flowers starting towards the end of spring or early summer and continuing all the way to first frost in fall. The flowers radiate outward and downward. Butterflies and hummingbirds flocked to it throughout the season and the deer, which there are many around my place, didn't touch it. Will only need supplemental water during long periods of dry weather during summer. Plant it in well-drained soil. Like most other butterfly bush, Purple Haze is not too finicky about soil type provided the soil is well-drained. For best flowering plant it in a very sunny location. Light shade is tolerated but too much shade will result in decreased flower production. Because of it's lower height and spreading habit, Purple Haze Butterfly Bush can be useful as a groundcover or border, or in small to large groups in sunny landscape beds. It is also suitable for mid-size to large containers and large hanging baskets. You could probably get by without pruning, but I prune the Purple Haze Dwarf Butterfly Bush in late winter or early spring. You can use hand pruners to remove 50% or more of the height of the plant. I usually prune it to about 6 inches or so above the ground. I've seen no problems with insect or disease on Purple Haze Butterfly Bush. Deer won;t touch it. It doesn't like consistently wet soil so make sure to plant it in locations that provide well-drained soil. I fertilize butterfly bushes after new growth has begin to emerge in spring with a good flower food.